This will be my last posting on the “working for space outside NASA” topic…at least for now. Today I’ll be talking about space efforts managed in nations besides the United States of America (fair warning: this entry is ~3,000 words). This article will serve as nice-to-know information for my fellow Americans and more practical information if you live elsewhere in the world and are interested in working in the space business. As these articles have made clear, NASA is not the only game in town. Can You Work for Other Countries’ Space Programs? Honestly, I don’t know the answer to this question. My off-the-cuff answer would be, “It depends.” Ever since the first Sputnik launch, most national governments have equated satellites and rockets with nuclear warheads and missiles. That’s why many nations (including the U.S.) treat space as a matter of national defense or security rather than mere space commerce or a domain for science. That’s also why there are export controls like the International Traffic in Arms Regulations (ITAR) in the U.S. and similar regulations around the world. Exporting or trafficking in one nation’s rocket-related (primarily guidance and propulsion) technologies is seen as a national security risk because it’s equivalent to–potentially–giving a hostile foreign power the ability to build their own intercontinental ballistic missiles (ICBMs). Assuming you’re not a spy or an arms dealer, if you wanted to work for another country’s space program, you might be able to, but only on the science or payload sides not on the rocket-designing or -building parts of the programs. Every country likes to hold their own “secret sauce” closely. More on this later. From 1957 onward, the U.S. and USSR were in a “space race,” trying to out do each other with technical firsts. The Russians were ahead well into the mid 1960s, pulling off the first artificial satellite; the first live animal launched into space (the dog, Laika, died in space); the first animals to successfully orbit and return to Earth; the first man in space and the first man in orbit, Yuri Gagarin; the first man to spend an entire day in space; the first woman in space, Valentina Tereshkova; the first extravehicular activity (“space walk”) by cosmonaut Alexei Leonov; the first objects to fly by and impact on the Moon (Luna 1 and Luna 2); the first “group” (multi-vehicle) space mission; the first space stations; the first soft landing on the Moon;first human-made object to land (impact) on another planet, Venus; the first robotic sample return mission from the Moon; and the first soft landing on Venus. There are others, but you get the point. The Russian space program has built upon the early successes it enjoyed during the Cold War (despite losing the “Moon Race”), and now their hardware includes key modules of the International Space Station (ISS), launch vehicles, and spacecraft for sending crew and cargo to the Station. Other Russian rockets are launching commercial payloads from Guiana Space Centre in Kourou, French Guiana, under a cooperative agreement with the European Space Agency (ESA) and Arianespace. Other Russian rockets are doing what they’ve done since the 1950s: served the satellite launch needs of the Russian government and military space programs. Russia also launches payloads (and human space explorers) for other nations. And while the science portion of Russia’s space efforts has faced a lot of budget cuts, they haven’t neglected those efforts. 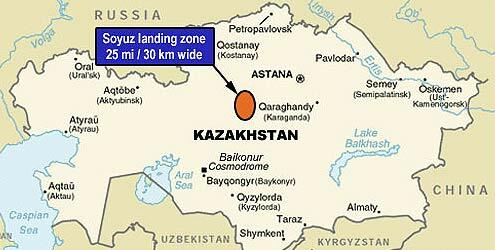 The Russian rockets lift off primarily from Baikonur Cosmodrome in Kazakhstan, Central Asia. Other launches lift off from the Yasny launch base in Russia, near the border of Kazakhstan. Russian Soyuz crewed spacecraft “soft land” by parachute on the deserts of Kazakhstan. Russia is also responsible for part of ISS mission control (during night time in the Western Hemisphere). That’s why the ISS orbit is inclined to the Equator at 57.3 degrees–so Russian can access it from Baikonur and keep in direct contact with it by radio and video channels. Despite up-and-down tensions between the U.S. and Russia, NASA continues to cooperate with and depend on Russia to provide mission control monitoring and launch services for astronauts to the Station aboard Soyuz rockets. That may change once the U.S. Commercial Crew program produces reliable crew services to ISS. Up until the late 1960s or so, European nations on either side of the Iron Curtain could not afford the massive space spectaculars of the two Cold War superpowers. That’s not to say some did not try. The United Kingdom and other Western European nations were interested in developing their own domestic capabilities for building rockets, missiles, and space hardware. They decided to pool their resources; their original effort at rocket development was called the European Launcher Development Organization (ELDO). Its first project was a British rocket called “Blue Streak.” Built in the mid-1960s by Great Britain, France, Germany, France, Belgium, Italy, the Netherlands, and launched from Australia, the Blue Streak was later named ELDO then Europa. Europa, however, had quality and stability problems. After numerous failures, the program was eventually canceled when the UK and Italy withdrew. The ELDO effort was not a complete loss. A French-German follow-on rocket to Europa, called Europa-3, would eventually form the basis for the highly successful Ariane rockets. ELDO’s successor organization, the European Space Agency, was formed in 1975 when ELDO was merged with the European Space Research Organization (ESRO). ESRO started Europe’s cooperative science program and developed a number of satellites, though many of them were launched by the U.S. Since ESA’s formation, Western Europe’s space efforts have been much more coordinated and successful. ESA’s science efforts have been extensive and include instruments and spacecraft for lunar and planetary exploration, as well as telescopes and imagers for space and Earth observation. They’ve been coordinating a Europe-built global positioning system called Galileo. Together with Airbus Space & Defence, ESA has built the Ariane expendable rockets, which began flying in the 1980s, grew in size and capability, and ate into the U.S. market share of commercial space launches up until this decade. Arianespace, a commercial offshoot of CNES, the French space agency, is responsible for production, operations, and marketing. Arianespace can lay claim to being the world’s first dedicated commercial space launch system. ESA has also ventured into human spaceflight, having built the Columbus, Harmony, and Tranquility modules for the Space Station, as well as the Cupola (the multi-pane window that gives astronauts outstanding views of the Earth), a data management system, and a robotic arm. Beyond that, for several years, as part of their ISS contribution, ESA launched several Automated Transfer Vehicles (ATVs), providing cargo to the Station. That ATV hardware is now being developed as the service module for NASA’s Orion spacecraft. And while it is not precisely an ESA activity, several of the nations under the ESA umbrella (including the UK, France, Germany, and Italy) have built satellites buses for developing nations. Examples include the UK company SSTL building satellite buses for Nigeria or France’s Airbus Defence & Space building satellites for Algeria and Peru. So when you look at the scope of ESA’s activities, shared across 22 countries, the Europeans are getting a lot of bang for their bucks and can point with obvious pride to a broad and accomplished space program. And, like NASA, ESA is partnering with large aerospace contractors and academic institutions to build the rockets, spacecraft, and instruments needed to carry out their missions. In terms of scope/size, the next-largest space program is probably China’s. Like the U.S. and USSR, China sought rockets for their ability to launch nuclear weapons. However, they eventually expanded their program to satellite launches; their first was aboard a Long March rocket in 1970. Since then, China has followed the progression of most of the other spacefaring nations, building and launching its own communications, surveillance, science, Earth observation, and global positioning satellites. The first step is to launch a manned spaceship, set up primarily integrated experimental manned spacecraft engineering, and carry out space application experiments. The second step is to make technology breakthroughs in Extravehicular Activities (EVA) as well as space rendezvous and docking of manned spaceships and spacecrafts, launch a space lab, and provide a solution for space application of a certain scale with man-tending on a short-term basis. The third step is to establish a space station, and provide a solution for space application of larger scale with man-tending on a long-term basis. What the West knows about China’s program to date is that they have accomplished nearly all of these efforts, having conducted their first successful flight of a crewed spacecraft (Shenzhou 5) in 2003; launched their first space station (Tiangong-1) in 2011; and launched its second, more advanced space station (Tiangong-2) in 2016. They launched and refueled an automated spacecraft called the Cargo Vehicle System in 2017. While Tiangong-1 was a single-module space station that will likely reenter the Earth’s this year, Tiangong-2 is supposed to be the first module of many for a permanent space station. The challenge with China right now is that the authoritarian nation is still perceived to have ambitions hostile to U.S. interests (recall my earlier discussion about ITAR). As a result, cooperation between China and NASA (or other Western nations) seems to be a long shot in the near future. India’s initial space efforts included launching sounding rockets as well as working with NASA to provide educational programming to villages in the Indian interior via satellite. Their first satellite, Aryabhata, performed X-ray Astronomy Aeronomy and Solar Physics studies and was launched aboard a Soviet Intercosmos rocket in 1975. The nation’s first Earth observation satellite, Bhaskara-1, flew in 1979. More importantly from a domestic capability standpoint, India successfully launched its first Satellite Launch Vehicle in 1980. While ISRO has launched payloads aboard Russian and U.S. launchers, it has continued to grow its launch vehicle capabilities, currently flying its Polar Satellite Launch Vehicle (PSLV) and Geosynchronous Satellite Launch Vehicle (GSLV). In the last decade, ISRO has sent spacecraft to orbit the Moon (Chandrayaan-1) in 2009 and Mars (Mars Orbiter Mission) in 2013, with a follow-in lunar mission in the works. There has been some talk of human spaceflight originating out of Satish Dhawan Space Centre in the future, but those efforts have been hampered by budget cuts. In short, India’s space program is ambitious and growing in its capabilities. When I attend space advocacy conferences, one of the largest contingents of overseas students usually comes from India, and the students are invariably polite and on fire to do great things in space. Japan’s space program was born in 1969 as the National Space Development Agency (NASDA). It was subsequently merged with the Institute of Space and Astronautical Science, the National Aerospace Laboratory in 2003 to become the Japanese Aerospace Exploration Agency (JAXA), the name it is known by today. NASDA’s work began with development of rockets, specifically the N-1, a Japanese version of the McDonnell-Douglas (now Boeing) Delta/Thor rocket, which flew from 1975 to 1982. The N-II also flew Delta/Thor technology. The nation’s first fully domestic rocket, the H-I, first flew in 1986. The latest Japanese launcher, the H-IIA, first flew in 2001 and is capable of launching payloads to low-Earth, sun-synchronous, and geosynchronous orbits as well as on escape-velocity missions to elsewhere in the solar system. In addition to satellites, the H-IIA has launched cargo spacecraft to the International Space Station. The Japanese space program launched its first satellite in 1975, followed by its first geosynchronous satellite in 1977. They have subsequently put up communications, Earth observation, and global positioning satellites. Japan can also lay claim to being the first nation to land and return samples from an asteroid in 2010. Japan began its own astronaut program in the early 1990s, acquiring rides aboard the Space Shuttle from NASA as early as 1997. Now Japanese astronauts fly to the International Space Station aboard Soyuz rockets, like American astronauts. A Japanese astronaut commanded the International Space Station for Expeditions 38/39. Going into the 1950s, our neighbor to the north had a domestic aerospace industry that stood on a par with that of the U.S. One of their projects was the Avro Arrow, a delta-winged fighter-interceptor years ahead of its time. The Arrow was designed and built to intercept Russian bombers and dominate the contested skies over the Arctic Ocean. (They even made a movie about it years later.) When the program was canceled due to changing defense policies, many of the engineers who worked on the Arrow later ended up supporting NASA’s Apollo mission. Despite that setback, Canada’s aerospace and defense technology firms continue playing a prominent role in space. As a close ally of the U.S., Canadians have designed and built robotic arms for the Space Shuttle and International Space Station; communication, Earth observation, science, and natural disaster-observing satellites (as early as 1962); and technologies for Mars rovers. There have also been 14 Canadian astronauts since 1983, four of them active now. Astronaut Chris Hadfield, became the first Canadian to command the Space Station. In short, Canada has carved out a niche all its own–a supporting role to the larger programs, perhaps, but still an independent effort that helps make other projects possible. This entry went on longer than I intended, so I’m going to cheat. The narrative above is by no means comprehensive. Below are the other nations that are capable of launching hardware into space, have sent humans into space, or both. The Ukrainians inherited a space launch capability when the Soviet Union broke up in 1991. This capability included the ability to build and launch rockets such as the SS-18 missile, subsequently called the Dnepr launch vehicle as well as the Zenit rocket, which has been launched commercially as part of a joint venture with U.S. company Boeing, SeaLaunch. Ukraine’s first astronaut (wearing the Ukrainian flag) flew to the International Space Station aboard the Space Shuttle in 1997. Ukraine does not have its own spaceport and so has had to depend on Russia’s Baikonur Cosmodrome to launch its rockets. The Russian annexation of Crimea negatively impacted Ukraine’s ability to launch from Russia or export hardware to the nation, leaving the country to seek other outlets. The Israel Space Agency (ISA), begun in 1983, has managed to develop space launch, satellite, and astronaut capabilities. They have a single spaceport on the Mediterranean Sea, which must launch due west to avoid encroachment on hostile neighbors’ airspace and to avoid dropping any stages or other debris onto structures or people below. They have, however, also had their satellites launched on Indian (ISRO) vehicles. Unfortunately, the first Israeli astronaut was lost when the Space Shuttle Columbia broke apart upon reentry in 2003. A member of the Saudi Arabian Royal Family flew aboard the Space Shuttle in 1985. A former Saudi Air Force Pilot, Prince Sultan helped deploy a Saudi communications satellite. He is the first Arab to fly in space. Saudi Arabia has also funded U.S.-built satellites for communications, science, and Earth observation purposes and is now building their own satellites domestically. The Republic of Korea has launched a series of sounding rockets but it has had to reach out to international partners to develop an orbital launch vehicle. The Khrunichev organization in Russia cooperated with South Korea and helped them develop a rocket originally called Korea Space Launch Vehicle (KSV) 1, subsequently called Naro-1. It has had only one successful launch in 2013, and the U.S. has been reluctant to encourage further rocket development given the current instability on the Korean peninsula created by the increasingly ambitious rocket-launching efforts of North Korea. Brazil is a relatively new player in space, beginning their space program in 1994. The worked with a variety of suborbital sounding rockets before beginning development of its Vertical Launch System (VLS). The program was canceled in 2016 due to ballooning expenditures and governance problems. Iran & North Korea have been working on their own space launch capabilities, but they are so far down on the list of friendly international players that I doubt they will be partnering with the U.S., Russia, China, Europe, or any of the other major players I’ve discussed any time soon. When ITAR comes up, it usually refers to these two nations first. As with China’s space program, the rest of the world learns about their space capabilities once they do something, often unexpectedly. Both nations have launched satellites to orbit successfully, and Iran has expressed interest in developing a domestic human spaceflight capability as well. I would be remiss if I didn’t mention one U.S. venture (one I worked for): SERVIR, which is a combined USAID/NASA effort to provide developing nations with access to weather and climate data from NASA Earth observation satellites as well as analysis applications to help address issues like flooding, glacier monitoring, and drought. The program has established “hubs” in Kenya, Nepal, and Thailand, with others in the works (or so I recall). The hubs are regional data centers staffed by scientists from the area and the goal is to eventually make the hubs self-sustaining. I sincerely apologize if I’ve left out others. I had to stop at some point. There are many other nations that have flown space hardware on every continent; you can visit Wikipedia to find a list of the 70+ nations that have national space agencies of some sort; the 10+ nations capable of space launch; or the three nations capable of human spaceflight or soft-landing hardware on the Moon (hint: it’s the same three). You can find the other entries here: Part 1, Part 2, Part 3. Quote | This entry was posted in careers, technical writing and tagged international space programs, space exploration. Bookmark the permalink.